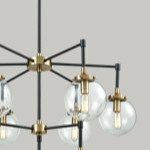 Eclectic design, by its nature, is tough to pin down. 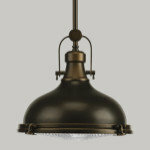 It’s not immediately identifiable, like farmhouse, Victorian or modern style. 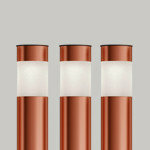 Instead it’s a combination of these styles, sometimes many of them. 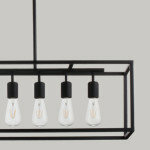 In other words, eclectic spaces have a personality that you can’t quite put your finger on. 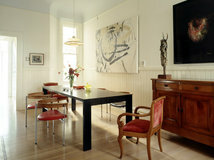 There’s always the sense that the furnishings and artwork were collected over time by someone who didn’t judge a piece on whether it would fall in line with the look and feel of the home’s other pieces, but rather on how it made the homeowner feel. 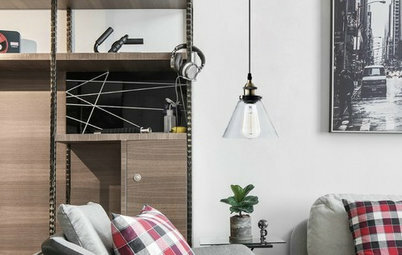 And that’s why an eclectic space is always a unique one, with feeling. 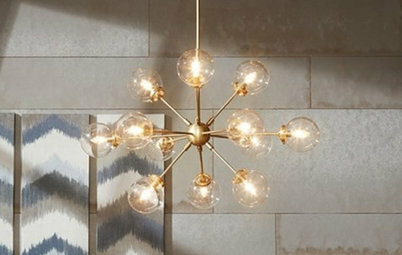 A space about which you imagine the homeowner’s saying, “It’s just me.” Sometimes it’s sophisticated; other times it’s downright quirky; but for the most part, an eclectic room is just fun and full of energy. To celebrate this character-centric design style, we’ve gatherered the top 15 eclectic photos uploaded in 2013. Does one speak to your own style? 1. The No. 1 most saved eclectic photo uploaded in 2013 was also the 23rd most saved photo overall and the No. 17 most saved kids’ room photo. It’s no doubt due to the arrangement of eclectic furnishings, which were mostly customized by interior designer Kristin Peake. She even carefully tested various pink gumballs in search of ones with the perfect hue to fill the custom desk lamp with. 2. 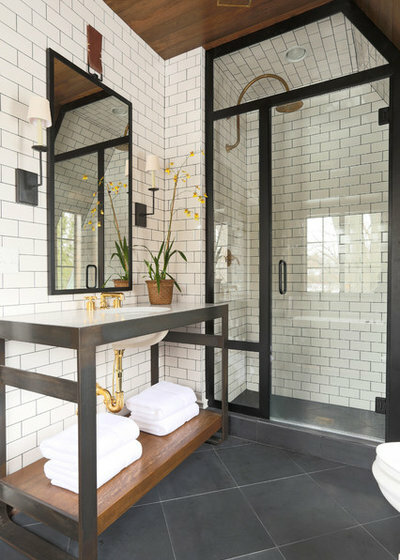 Eclectic design is all about skillfully mixing styles and periods, and this bathroom does just that. The white subway tiles are classic, but with a charcoal-gray grout, they verge on modern. A custom steel vanity with a rust-preventing finish similar to one used for gun stock lends an industrial edge to the traditional brass sink and shower fittings, while a slate floor once again modernizes things. 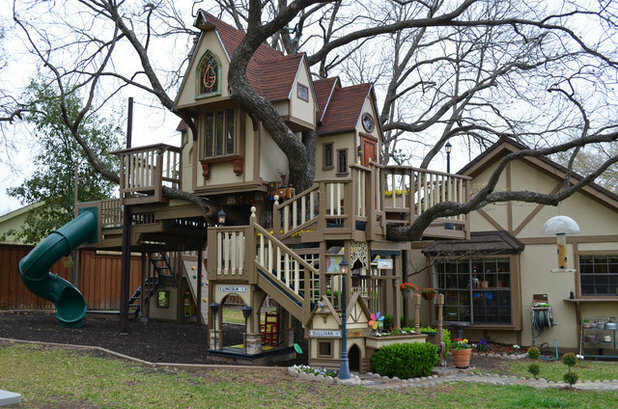 See more photos: The Most Incredible Kids’ Tree House You’ll Ever See? 4. 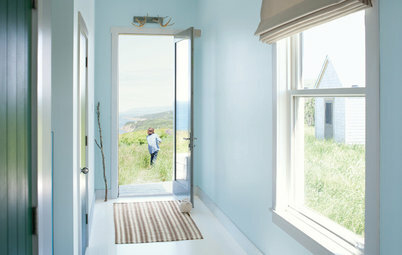 The picture ledges in this Canadian home helped turn this wall into something more than the sum of its parts. 5. Layers of patterns and fabrics steal the show here. Most readers want to know where the bed cover is from (Urban Outfitters) or the chandelier (Home Depot), but the wall paint (Rose Hips by Cloverdale) and the custom-built bed by Bigwood in Calgary, Alberta, are also popular. 6. 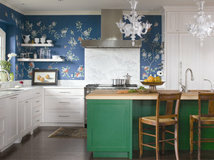 The La Cornue CornuFé stove sets the stage in this Portland, Oregon, kitchen. 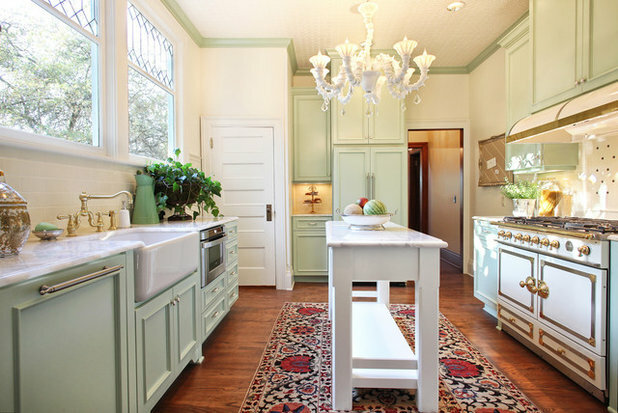 Pale green cabinets against white walls and a surprising rug make it truly one of a kind. 7. Layers of bright colors and touchy-feely texture stand out in this kids’ room. Trim outlines flocked wallpaper behind a patterned headboard, while colorful pillows sit on a thick turquoise window seat cushion. To really push the layers, interior designer Lori Ludwick added embellishments to a simple Ikea nightstand. She also custom made the feather-covered chandelier. 8. Roadside discoveries and DIY spirit go hand in hand with an eclectic look. Salvage-loving decorator Shannon Quimby found the blue chair on a roadside, the three white ones at a discount store and the brown one at a garage sale. 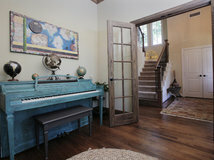 She painted the salvaged table’s base legs using a mix of all the green paints she found in her garage. 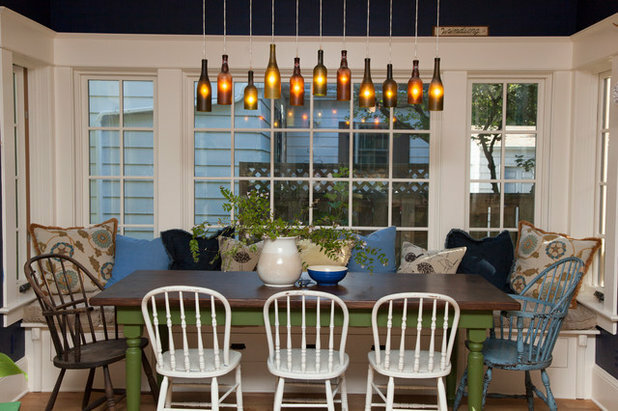 And she made the bottle lights by cutting off the bottoms of beer and wine bottles she found on her property during reconstruction, spray painting them with a frost spray and installing pendant lights from Lowe’s. 9. 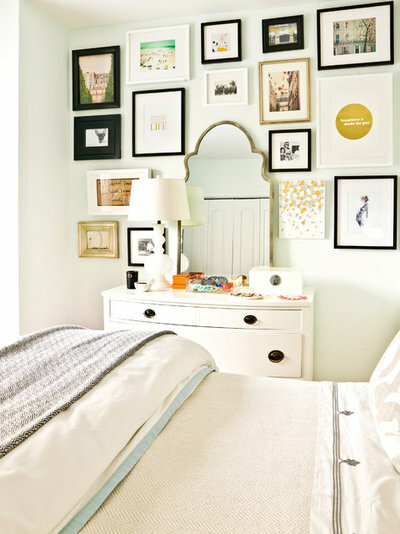 A photo collage using different frame styles and colors sets the tone for this eclectic bedroom. 10. A popular modern color like turquoise on traditional cabinets mixed with an antique mirror backsplash achieves a slightly eclectic design. 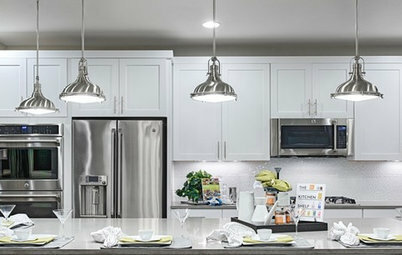 But look closely and you’ll see a fun mix of cabinet pulls and knobs that gives the kitchen real personality. 11. This bedroom is all about opposites living in harmony: traditional and modern; bright colors and neutrals; textured surfaces and smooth ones; old and new. 12. 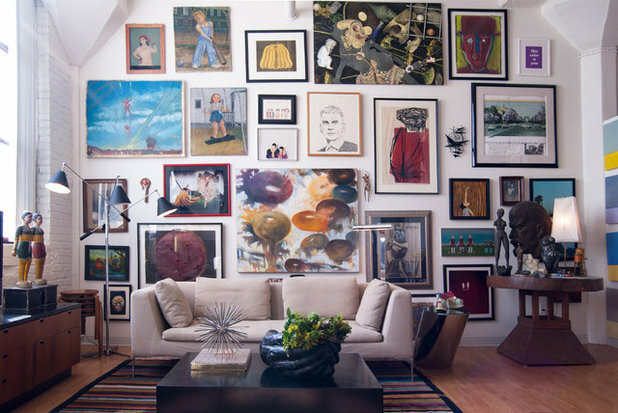 It’s no surprise this photo is popular: The collage wall has a vibrant mix of paintings and sketches that echo the collected furnishings and sculptural pieces. 13. Holy primary colors! 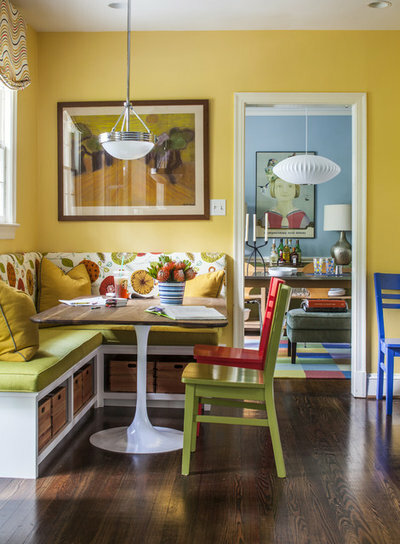 It’s hard to imagine a boring meal in this dining nook and adjacent room that pull from almost every color on the wheel. 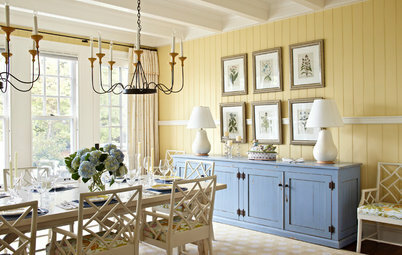 I love how the soft, warm yellow wall and bright banquette recall a farmhouse, while the Saarinen-style table base and nearby George Nelson lamp bring everything up-to-date. 14. Modern, industrial, farmhouse, oh my! This house has it all going on. 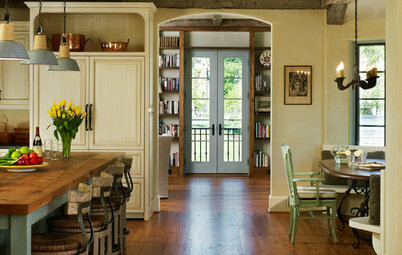 A sliding wood barn door on the second floor and bright colors balance the metal island on casters, metal stools and metal-framed glass light fixture to create a space that’s both bright and stark, warm and cold. Bonus eclectic points for integrating a flying dog portrait on the wooden structural beam. 15. Here it’s almost as if the designer took a traditional kids’ bedroom and hand dipped it in modern finishes. If this were a black and white photo, at first glance you might think this room belonged in another era. 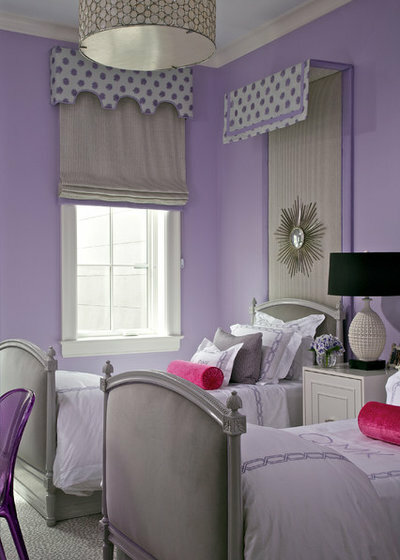 But with soft purples, modern grays and playful patterns, it’s a space meant for someone entirely of our time. 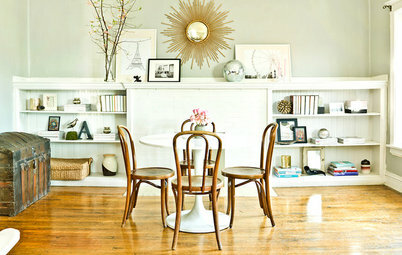 Your turn: Please show us your eclectic space in the Comments! 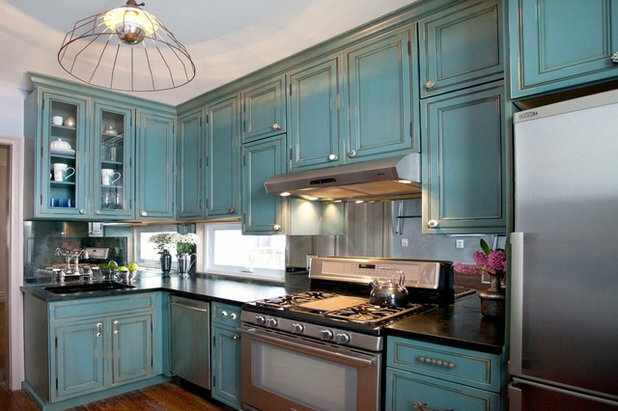 That blue kitchen is gorgeous. 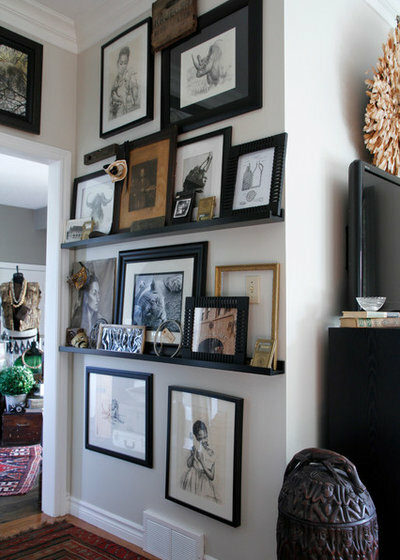 Absolutely love the photo/painting wall collage. What a great way not to have to pick just a few pieces. It works!! !